The 10th anniversary iPhone will be released this year and it’s shaping up to be a big update. Predictions so far include a glass and stainless steel redesign with a bezel-less OLED display, a new in-display Touch ID paired with facial recognition, updates to 3D Touch, improved waterproofing, wireless charging, and more. Conflicting reports have suggested that Touch ID could be moved to the back of the iPhone or even dropped altogether in favor of face-recognition. Some have suggested that Apple could move Touch ID to the power button, but it seems unlikely this would offer sufficient surface area for the type of sophisticated sensor used in existing iPhones..
Are you ready for iPhone 8 – Apple's latest flagship smartphone, with upgraded cameras, water resistance and a longer battery life? To have a smooth and pleasant "Upgrade to new iPhone" journey, please have a check on this How Do I Transfer Data from Old iPhone to New iPhone tutorial to have a quick start.The iPhone default Calendar app is a good way to record the special date in your daily life, such as, the wedding anniversary with your husband, the birthday of your friends, the important conference of your work, etc. You might keep all these important events in your Calendar app on your iPhone. There is the possibility that you upgrade to a span-new iPhone 8 and you want to transfer everything from your old iPhone to iPhone 8, including the calendar event. So how to make it? Apple iTunes or iCloud might be your first choice, however, it might be very tedious and time-consuming to do the backup and restore job. Is there any easier way to transfer calendar from iPhone to iPhone? 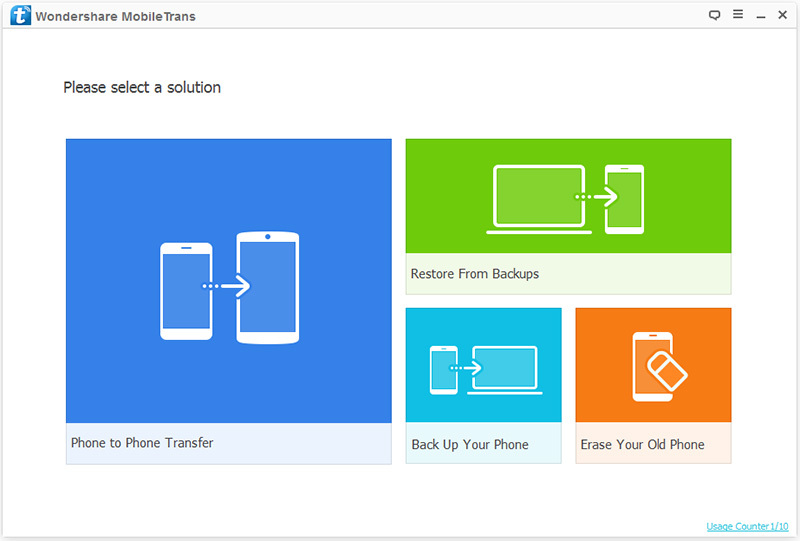 All we need is an iPhone content management tool named Mobile Transfer, as its name expresses, Mobile Transfer manages to transfer any data to anywhere you like. It can help you transfer calendar from iPhone to iPhone 8 directly. Besides calendar, you can also transfer contacts, messages, notes, music, ringtones, photos, videos etc. 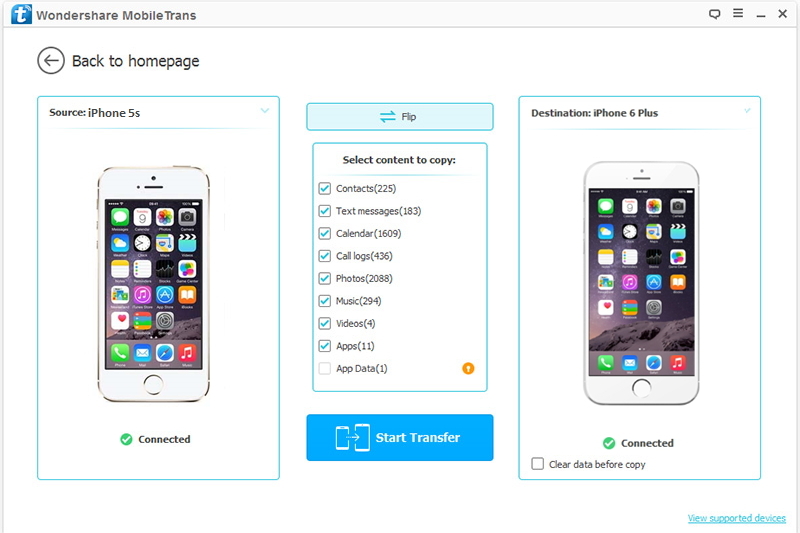 Mobile Transfer can also help you transfer data from computer to iPhone and vice versa. All of the transferring will not lead to any data loss. Here are the detail steps to sync your calendar between your iPhones. Step 2. After running the app, connect your old iPhone and iPhone 8 to a same computer with 2 USB cables at the same time. Then your phones will be displayed on the middle window as “Source” and “Destination”, if the old isn't showed on “Source” side, you can just click “Flip” button to change the places of the two phones. Step 3. After scan all contents on your two phones, you can see all the content on the software, such as SMS, contacts, photos, videos, music and more. Thus, you should select the "Calendar" and remove other marks and then click “Start Transfer”.